Next to 10-inch light bars, 20-inch LED light bars are the most popular choice for adding illumination to cars, trucks, 4WD vehicles and sports equipment such as ATVs, UTVs or boats. 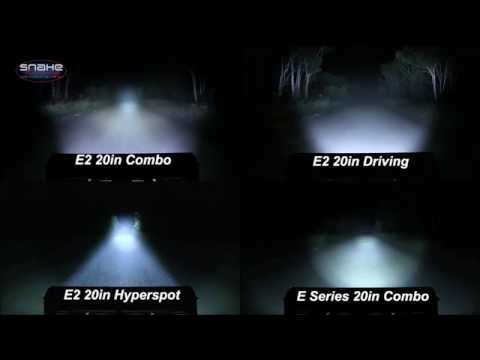 They provide plenty of light for night cruising and are easily paired to double light output. Mounted below a bumper and equipped with amber LEDs or an amber lens cover, they make outstanding fog or mist-cutters. Regardless of how you utilize them, 20 inch LED light bars are versatile pieces of lighting equipment that are quite affordable even for the highest quality products. 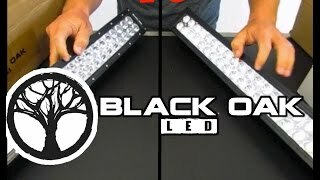 Black Oak’s D-Series 20 inch LED light bar is a perfect example of their commitment to top quality at prices far less than the competition. This dual-row light bar equipped with 5W OSRAM LEDs delivers 22,000 lumens of dark-shattering light in Spot, Flood or Combo beam patterns. The torture-proof extruded aluminum housing features a rock resistant polycarbonate lens and custom moisture seal to achieve an IP69K intrusion rating. It is ready to go with a complete wiring harness and 90-day money-back, satisfaction guarantee. Even using the 3W OSRAM LEDs, this 20-inch light bar puts out more light than many bars twice its length. With 5W LEDs, this could be your main driving light by itself. It is short enough that some buyers even tripod-mount these for use as portable work lights. In the harshest environments and on the roughest trails, this 20-inch Black Oak LED light bar will stand up to whatever gets dished out and shine more brilliantly than any other light its size. It is hands-down the highest value light bar you can buy in terms of durability, reliability and illumination performance. Rigid’s E-Series light bars have been making happy customers for a long time. Their 20 inch LED light bar is a perennial favorite of off-road enthusiasts. While delivering over 9,000 lumens of light, it draws less than 8 amps. The housing is extruded aluminum. Its custom rubber seal and GORE® equalizing vents help this light achieve an IP68 intrusion rating. Choose from Flood, Spot or Combo beams to match your application. Amber LEDs are also available. The Rigid 20-inch LED light bar in their E-Series is trail-tested and built as ruggedly as any light bar on the market. They use top-bin LEDs and high-quality circuitry so you will get the full 50,000 hour lifespan from this light. They are extremely popular with buyers for their steady, bright beams. 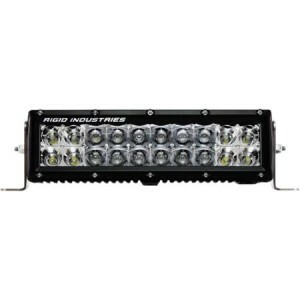 The high quality of Rigid Industries LED light bars is well-known among off-road enthusiasts. This 20-inch light bar finds a place or two on almost any vehicle and is ideal for ATVs, UTVs and boats. You pay a bit more, but receive a lifetime of value in return. Vision X has built a reputation for ruggedness and quality that has earned it preferred vendor status with NASA, the U.S. Border Patrol and other industry leaders. Their Xmitter XIL-400 Euro beam 22 inch LED light bar stands up to extreme environmental conditions, while providing 7,200 raw lumens of light in a beam perfect for highway driving. It is supplied with a complete, waterproof wiring harness. You are unlikely to utilize this feature, but the LEDs in the Xmitter line can emit IR, Amber, Red, Blue or Green. That feature, and the fact that these lights are built super tough, make them popular products with law enforcement, EMS vehicles, fire trucks and government agencies. For off-road or highway use, they are lights you install for the life of the vehicle that will deliver tons of fade-proof light and seamless beam patterns. The Vision X Xmitter 22-inch light bar with Euro beam configuration is the perfect all-around driving light you can buy. It will stand up to any environmental conditions you can imagine and provide ongoing void-filling illumination for many years. The Baja Designs 47-2003 Stealth single-row 20 inch LED light bar has one of the lowest profiles on the market. It will fit in vertical gaps under two inches high. The long rearward taper ensures minimal whistling if it is roof or rack-mounted. Twenty choice CREE XP-G2 LEDs provide 8,400 lumens of 6000K bright white light from within the aircraft-grade IP69K housing. CopperDrive circuitry ensures that you get 100 percent of LED output while extending their lifespan to 50,000 hours. This ultra-low-profile light bar stays well hidden until you flip the switch, when it puts out an astonishingly bright, void-less flood/spot beam from high-efficiency, top-bin XP-G2 CREE LED. This light bar is built to outlast your vehicle under the harshest conditions that you can dish out on the trail or on the water. Baja Designs LED light bars are unquestionably some of the most rugged, durable and reliable light bars made. They have earned their bragging rights through some of the roughest dirt racing in the world. Given how long it will last, this 20-incher will return superb value. 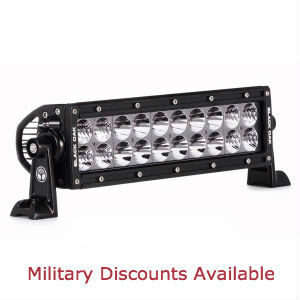 Auxbeams super-affordable 20 inch LED light bar finds a multitude of applications. They are used as driving lights, navigation lights and work lights. They shine with 12,600 raw lumens from 42 3W CREE LEDs in a dual-row arrangement. The 30-degree Spot and 60-degree Flood combination beam pattern provides a penetrating beam and plenty of broad illumination to the sides. The LEDs are protected by a shatterproof polycarbonate lens and a 6063 aluminum housing with an IP67 intrusion rating. This is a decent budget light that has light output comparable to much higher-priced LED light bars. It is made mainly as a driving light with a combo beam pattern. Instead of using end brackets, it has two mid-mounted bolt brackets on the bottom, which may suit some mounting applications better than end brackets do. If you are looking to add several 20 inch LED light bars, then the low price of this Auxbeam unit should be appealing. It is an ideal entry-level light that has great light output from CREE LEDs, but is not built to last more than a few years. For the price, however, it does present a good value. The Nilight Nl18A triple-row spot/flood combo 20-inch light bar provides outstanding visibility for boats, trucks and 4WD vehicles. Three rows of high-intensity, 30,000-hour LEDs create a deep-reach center beam while end rows of LEDs flood the foreground and sides. Deep cooling ribs mean long LED life. Custom seals, a tough polycarbonate lens and a rugged 6063 aluminum alloy housing protect against moisture and dust with an IP67 intrusion rating. Aiming your light is easy with 45 degrees of vertical adjustment plus a horizontally sliding mounting bracket. 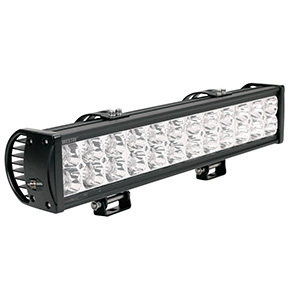 The Nl18A is an impressive 20-inch light bar with features usually reserved for more expensive lights. It is well-designed with powerful LEDs plus advanced reflectors for a night-busting 28800lm illumination output. It quickly mounts on any vehicle or watercraft. You would be hard pressed to find another 20-inch LED light bar with all these features, design and awesome light output. After using this light, your normal headlights will seem like candles. Note there is no wiring harness supplied and most buyers re-seal the lens with good quality silicone. For off-road, work or farming activities, Nilight’s 20-inch 12,000lm dual-row combo beam light bar offers exceptional versatility. It features a wide voltage range, sliding post mounts, vertical beam adjusters and ample brightness to blow away the gloom. 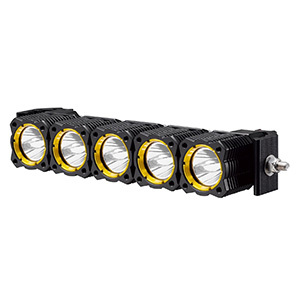 This light features a rugged 6063 aluminum housing, PC lens, 30,000-hour LEDs and an IP67 waterproof rating. It comes with a 10-foot wiring harness complete with switch, fuse and relay. One customer, unfortunately, hit a deer at 70 MPH, which tore off his Night light bar. It still works great! 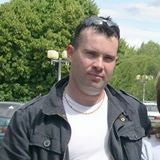 Is that rugged or what? Buy one or two now. At less than two bucks per inch, this bar is an excellent value with loads of uses. 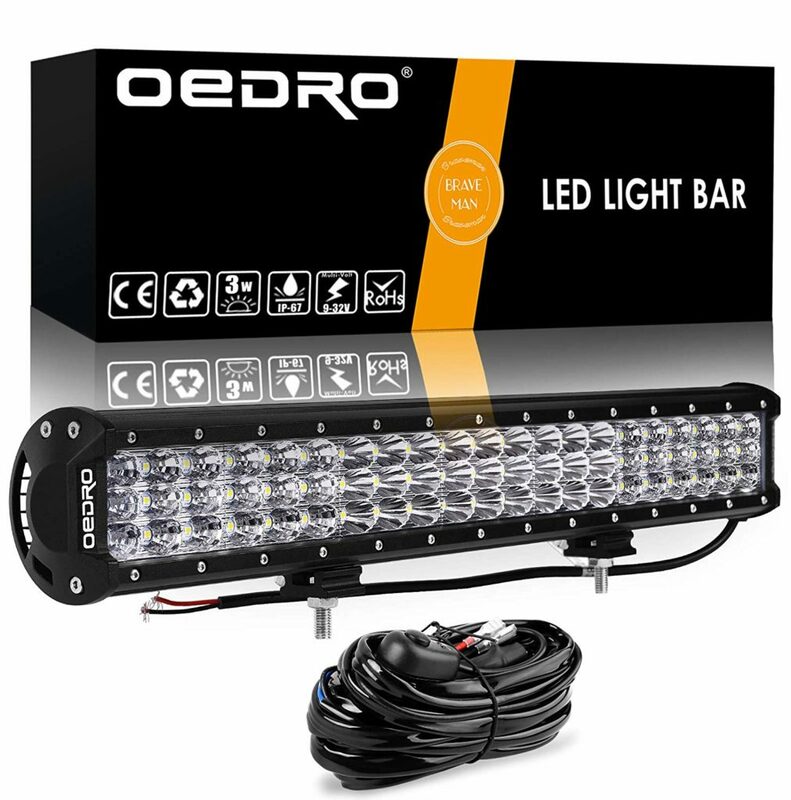 This amazing oEdRo 20-inch flood-spot combo beam light bar pushes the limits of bright for a 20-inch bar with 63 50,000-hour LEDs. It is one-third brighter than a dual row bar. It features 11,200lm of brightness, an IP67 rating and super-versatile mounts. It comes with a full wiring harness plus three-year warranty. Buyers love how easy these lights mounted on a rack, in the grill, below the bumper and so on. Everyone gushes at how ultra-bright the three-row design is. This oEdRo powerhouse is a steal especially considering they throw in a full wiring harness. Buy one to keep on hand even if you do not have an immediate use as it is ultra-versatile. This Senlips 20-inch combo LED light bar places 70 percent of the LEDs in the center spot for extra reach on the trail or highway. It delivers 10,500lm of cool white light behind a PC lens with IP67 intrusion rating. Features sliding post mounts with vertical swivel slots. 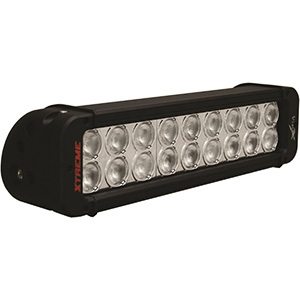 Customers use this light bar for off-road vehicles, tractors or tripod-mounted campsite or work site illumination. Despite a large spot beam section, some were disappointed with the reach. You can easily afford to buy two or more to trick out your 4×4, UTV, ATV or even your boat. Mount one forward to augment your stock bright beams on- or off-road. The 20-inch range of LED light bars provides tons of versatility with regard to mounting options and plenty of products with enough light to act as standalone highway or trail lights. Often, they are paired to double the light and provide wider beam coverage. They are small enough that they make convenient work lights or navigation lights on watercraft.